Freshly caught dart after being skinned make a very tasty meal. Swallowtail dart are primarily a surf species most commonly found from the mid New South Wales coast to the northern tip of Fraser Island in Queensland. 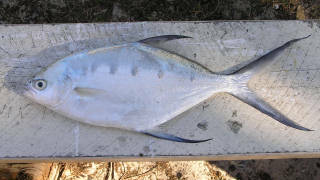 The dart (trachinotus russeli) is a relitively small species of the trevally family and has as a close cousin the very powerful snub nosed dart (T. blochi) which also carries the name oyster cracker and permit in some areas. One thing that both species posses is a power and tenacity far beyond most other species of fish of similar size. Available throughout most of the year dart sometimes makes up the by catch for species such as bream and tailor, but can be caught in better numbers when targeted exclusively. Their diet varies with food availability with their most common targets being worms and pippis, however when on offer they will happily take small baitfish, surf crabs, prawns, yabbies and the flesh of larger fish. Deep gutters with heavy white wash from breaking waves on the outside bank are an ideal spot to catch these small but tenacious fish. 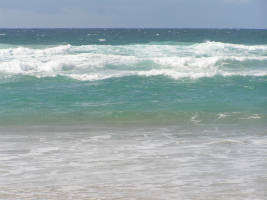 The darts mastery of the waves can be witnessed visually at times when schools of these fish run down the face of breaking waves, sliding off to the side just an instant before the wave slams heavily into a sandbank. Peaking at a little over 1 kg in weight the swallowtail dart although small can easily catch the unwary fisherman out as it may go from pulling strongly to racing in with a beach bound wave only to turn 180 degrees on the madly winding fisherman and snap light lines. They will use every current and rip available to try and elude capture, darting this way and that even when finally brought into the beach wash, never conceding defeat till safely landed on dry land. Sometimes despised by tailor fishermen for picking at quality baits such as pilchards meant for bigger fare, they should not be discarded as rubbish fish for their eating qualities when skinned are easily equal to or in my opinion far better than tailor.